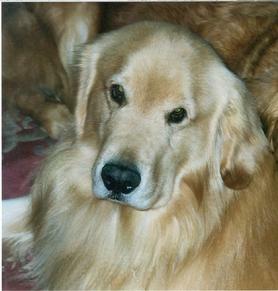 The story of Pet Loss Help.Org really begins with Dickens, aka Blue Skye Christmas Triumph, a magnificent golden retriever and pioneering therapy canine. Dickens, who was Delta Certified and remains in the Hall of Fame of several organizations for his groundbreaking therapy work, established psychiatric animal assisted therapy programs in three Bergen County Hospitals which are still helping thousands of people today. As the first canine entrusted with this role, Dickens worked with patients and staff in both individual and group capacities and also worked in nursing homes, with veterans, and families affected by 9/11. During his life, he appeared on many national TV segments educating the public about animal assisted therapy including "Inside Edition", "Pet Stop", "NBC News" and other cable channels. Pet Loss Help. Org was founded by Susan Dowd Stone, MSW, LCSW, Dicken's partner in his life's work and was the first facilitator of the longest running animal companion bereavement program in Northern NJ at Oradell Animal Hospital for 14 years. Ms. Stone is an award winning psychotherapist with a practice in Englewood Cliffs NJ, an author, and an Adjunct Assistant Professor in the Silver School of Social Work at New York University, where she presents courses and workshops at the graduate and post master's level on CBT, DBT, IPT and grief/loss. She is a former Public Reviewer for the National Institute of Mental Health. She was the recipient of a Golden Bell Leadership Award from the Mental Health Association in NJ for her work as a clinician and advocate. Additionally trained in trauma, EMDR and bereavement, Ms. Stone has been providing grief counseling for those mourning human and animal companions for over two decades. She speaks at veterinary conferences on the human animal bond, consults with veterinary practices on compassion fatigue and leads workshops on forming and maintaining animal companion bereavement programs. Her online book, to be entitled "Triage for Animal Companion Loss", will be available on this website and other online venues in the fall of 2017. A former Delta Instructor, Evaluator and Pet Partner, Ms. Stone, with her canine Dickens, proposed and implemented Animal Assisted Therapy Programs in the psychiatric units of facilities which are still active today in Bergen County. For their work, Stone and Dickens were presented with a President's Service Award from New York University for Community Service, the NJ Medical Veterinary Association Hall of Fame Award, and a Delta Society national award for their work as a therapy team. If located in the tri-state area, individual counseling sessions are offered at her office. You may contact Ms. Stone by clicking here.